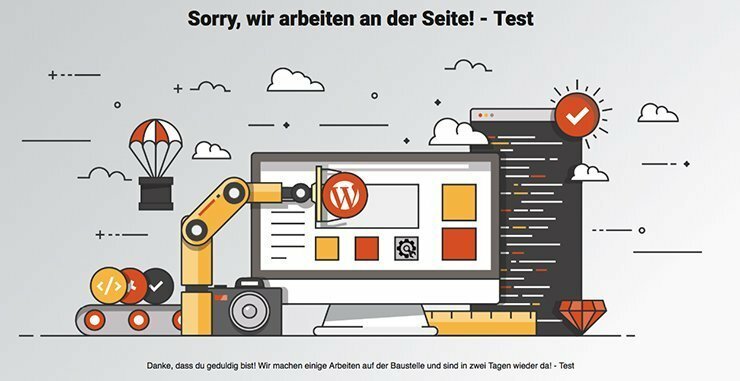 In order to keep the old customers and get the new ones on your WordPress website, you have to think of a lot of things. It doesn’t matter if you are just starting out or already expanding globally. The customer is needy, and is always right, considering that it is their wallet you want to exploit. Yes, most of us speak English but that doesn’t mean our websites should all be JUST in English. See how easy it is to make a multilingual under construction page with some help from UCP an @weglot. Not only that this is a buzz-killer for your customers, but it can also cost you several of them, as they head out in a hunt for a more reliable solution. What you must not do is leave them out there somewhere to hang. Make sure to have your “Under Construction” page appear instead of “Page not found”. Let them know when you will be back, if possible. If not, direct those people to your Facebook, LinkedIn or even Instagram page. You don’t want to chase them away into the competitor’s arms. Setting up an “Under Construction” page is no easy task, yet with the right plugins, it could be done in a matter of minutes. But what if your website is relying heavily on foreign customers? Showing them your “Under Construction” page in a single, foreign language, will yield the same result as the “Page not found”. Let’s call a spade a spade. Someone types your website’s name into Google. The URL pops up, and then they click on it. They did not get what they were looking for, as your website is unavailable. “Did they shut down?”. Then they go back to Google and they type the issue they need the solution for, but, in their native language. They see competitions’ URLs pop up. Once they click on any one of them, they are probably done with you. Well, the same way you have been doing it until now. With your “Under Construction” page containing the information that you will be back, but in their native language. 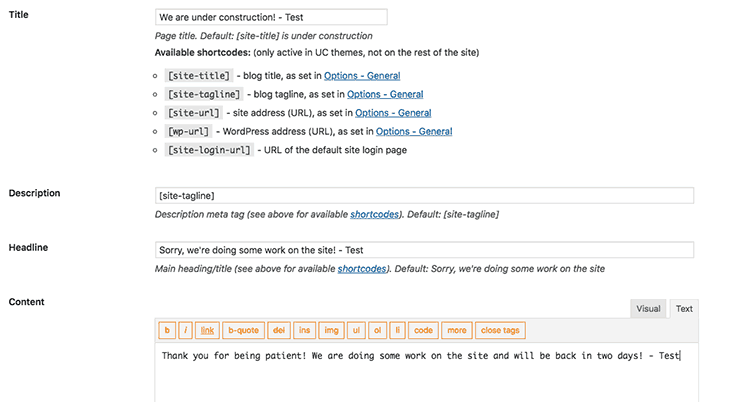 Luckily for you, two customer-savers have integrated into one: Weglot and UnderConstructionPage plugins. You can now translate everything, and keep your competition where they belong – away from your customers. 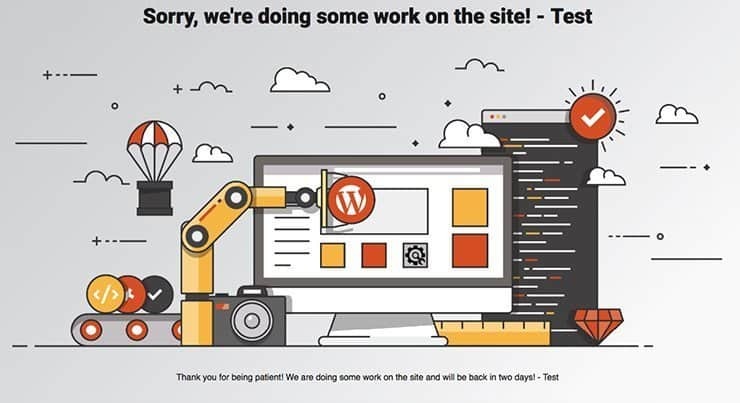 With your “Under Construction” page set up, and your foreign customers being diverted to your other communication channels thanks to the ability to understand the page, you can rest assured that they will be there when you relaunch. Yes, the best part about this integration is that you can do everything yourself. No need for developers to set up anything. Leave them to the more important work of creating something amazing for your website that you can’t actually do yourself. “But I don’t know any *insert language here*”, you might think. You can still make this happen, though. The next best thing is that you can translate anything with the Weglot plugin, without having to know the language, because it integrates beautifully with Google Translate. It will do the translation work for you. So, unless you have a long and detailed explanation of why your website is not available on your “Under Construction” page, you are probably good to go with this sort of translation. But even if you need more complex translation solutions, Weglot will get you covered in their premium service. Here is a step by step tutorial on how you can create a translated “Under Construction” page for your website. Can’t get started without these, right? Go to the plugins tab in your WordPress and “Add new”. Simply search for the “Under Construction Page” plugin, and you should be able to see it as a first result. Simply click on install, and then activate to get it going. If you need more help, please see the details on how to install UnderConstructionPage. Simply click on the “install Weglot plugin” now. It will provide you with a pop-up with additional information about the plugin and the button to start the free trial. The installation shouldn’t take more than a couple of seconds. This one is another fairly easy step and it shouldn’t take you more than a couple of minutes. Head on to the Settings, and then Under Construction. The easiest way to do this is to just follow the tabs and work as they go along. Under the main tab, you have a couple of switches. Use them wisely. Use the first one at least. Here, you can also set the automatic End date and Time, which is perfect prevention to the possibility of forgetting to turn off this mode once you are done. No need to be a designer or to hire one for this step. Just head out to themes, and pick one! There are more than 150 available themes with the premium version of this plugin, and you can preview each and every single one before making a decision. Just activate the one you like! You have to have something on your Under Construction page, right? At least, you have to have content to translate it. Just follow the instructions to write what you need to write. Here is our test version that will help you understand how it works. The preview of our test ended up looking something like this. Remember when we talked about Social Media? You can add the social media buttons on the site leading to them under the same Content tab. Now, all you gotta do is head on to Weglot tab. There, you will be able to see the language and the available languages. We went with German as our second language. Step #7: Button it up! When you save these changes, you will get a language switcher button on the right bottom of your page. You can further change the translation and button’s settings. Head on to preview your new “Under Construction” page, and switch the language to see the end result! Now you can effortlessly translate your “Under Construction” page, and every page you need into any language you need! You can grab their attention with a “Coming Soon page” in their native language, too. All of this without hiring a single developer or translator! You just need yourself and these two amazing plugins! Published on March 21, 2019 by Vladana; modified on March 22, 2019. Filed under: coming soon page, translate, weglot, WordPress. Your regular girl next door that prefers writing with a cup of coffee about a cup of coffee to everything. Loves a good walk, languages, discovering new places and overthinking. Has nightmares about writer's block and daydreams about chocolate soufflé.